Dr. Valerius Geist has some ideas. This photo emerged from a packing box over the weekend. 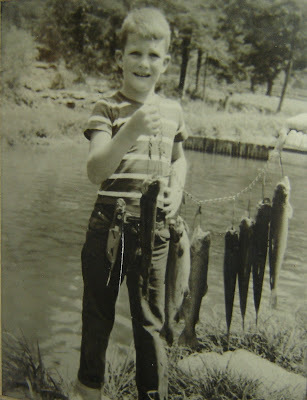 That’s Reid Farmer, age seven, with some rainbows we caught in the Arkansas Ozarks. That’s my grandfather Travis Reid’s hand holding the other end of the stringer. I really liked that sheath knife that I bought while on vacation in the Smoky Mountains. 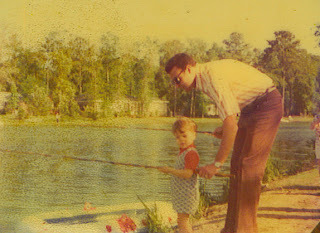 Steve and Matt – do you have any junior outdoorsman photos to contribute? The first issue of a splendid new magazine, “The publication for environmentally responsible, worldwide vehicle-dependent expedition and adventure travel”, has just become available. Editors include the Alpha Environmentalist and Roseann of Three Martini Lunch . Both content and style are first- rate. This is going to be a good one. Scroll down from here to that title to hear a Canadian broadcast on the possible 13,000- year old meteor strike that may have been implicated in the North American Pleistocene extinctions. We will be hearing more about this. (HT Walter Hingley). Annie D just introduced me to this treasure trove of Darwin’s letters. As I have mentioned before, I once held a fan letter to Jean- Henri Fabre from Darwin. It is not yet available in text but is catalogued here. … and otherwise. On Henry Chappell’s Home Range, he takes us out for a few days of old- fashioned East Texas hunting, fishing, and eating— bream fishing with bait, squirrel hunting with dogs, night hunting for raccoons. 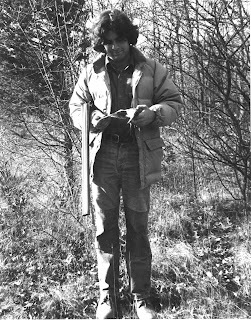 This is hunting- gathering as a life. Good pics too! And then there is what has to be the ultimate “Red State” story: the one about the eleven- year old Alabama kid who killed the thousand- pound feral hog. Hilarious. PETA, read and weep! Update: the whole “Hogzilla II” thing has gone downhill. Patrick has the whole sordid tale: not just exaggerated or a publicity stunt (though apparently both) but a tame pig. Disgusting. Darren has been too busy to post anything but amazing pictures, but he did email me a heads up on–!– not one but TWO new wolf species! Here is a link to the abstract. I hope Darren will soon be able to tell us more. “Navarro allegedly told an undercover Fish and Wildlife Service agent that he likes to “pummel” the hawks that he catches with a stick. Well, OK. But urban Coops mainly exist because of an oversupply of urban pigeons and doves adapted to the human- modified landscape (and if there were indeed 2000– a figure I am skeptical about– they were WAY out of “balance”. Well, a moment’s thought should tell the reader that something that can be performed “in unison” is not done “uncontrollably”. As Pluvialis points out in a recent post, only birds bred too closely go out of control; in fact, rolling and tumbling seem to be actions enjoyed by the birds. Unfortunately, as Rebecca reminds us, ” that may as well be a dinner bell to a hawk”. “I am often a little bit out of the mainstream on my views. If possible, I am even MORE paranoid than the average falconer, but my fears are for the big threats: The possibility that all private animal ownership be regulated in this country, if it is not eliminated altogether. There is a weird synchronicity between the government on one hand and the animal rights nuts on the other that serves the purpose of each. When these two get together, bad things happen for us and for everyone who likes to own and breed animals. “In addition to falconry, I also run a sighthound at game. The coursing flap in CA last year was really troubling to me. Those dog guys were out of line and sloppy and short-sighted, no question about it. And the notion of a point system (as in formal coursing) is alien to me and I think is a dangerous component to add to any legitimate hunt. “Nonetheless, running dogs at game is something I do, and so I took notice. As a falconer, the parallels are obvious also. Far better (in my view) that we should police ourselves and reach out to our own bad apples than to have the media, PETA or the state and federal government do our policing for us…. Amen. For more intelligent discussion from both pigeon and hawk folks, see the comments in this post of Rebecca’s, and the text in this one. 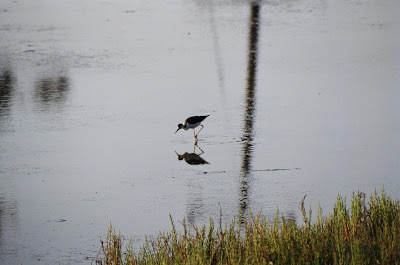 A Black-necked Stilt in Devereaux Slough near Goleta.